May | 2012 | Professional Use Only, No Warranty. Professional Use Only, No Warranty. 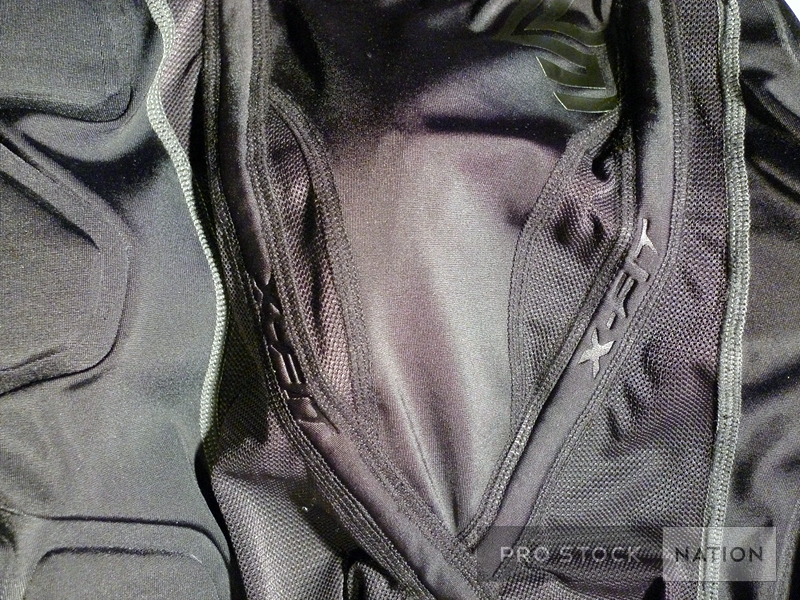 Today I will be reviewing the Shock Doctor 581 ShockSkin Hockey Impact Pant. Shock Doctor is best known for their mouth guards but they also offer a variety of other products ranging from insoles to equipment bags. Jack Johnson (Columbus Blue Jackets) and Nick Leddy (Chicago Blackhawks) are two NHLers currently endorsing their products. 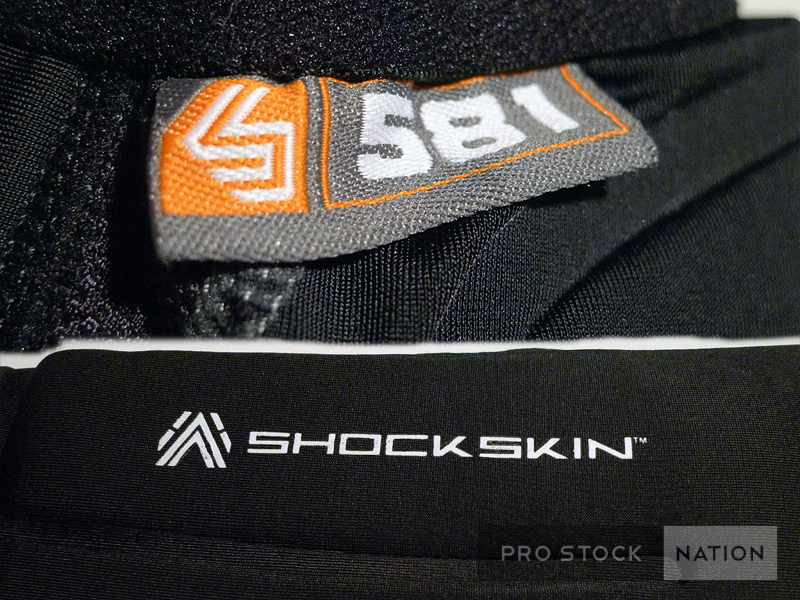 The 581 is a base layer pant designed specifically for hockey (they also make a ShockSkin short called the “583”.) Foam pads are strategically placed in key areas (thigh, hip and tailbone) providing the user with added shock absorption. The built-in cup makes this an all-in-one base layer and jock combo. It also features velcro tabs for sock attachment. 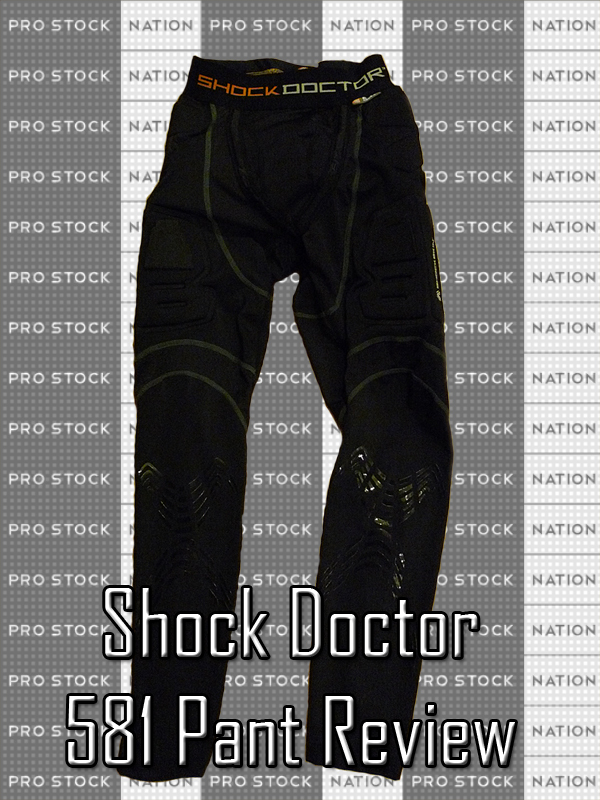 This is Shock Doctor’s top end pant and it is available in both Boy’s and Men’s sizing. What initially caught my attention was the build quality of this pant. It is superb. The materials feel very high end and lots of thought have been incorporated into building it. Craftsmanship, protection, and comfort are three words that come to mind to describe these pants. While there are other companies out there churning about padded base layers, what sets this Shock Doctor pant apart from the rest is how the foam pads are integrated into the fabric. The high frequency seams holding the pads in place are barely noticeable. What I didn’t like about wearing other padded base layers in the past was how bulky and restrictive they felt. This is not the case with the 581. I still get a full range of motion and I can barely notice the extra padding being there. To maintain a good airflow, mesh vents run from the back of the pant through the thigh area and into the calf. 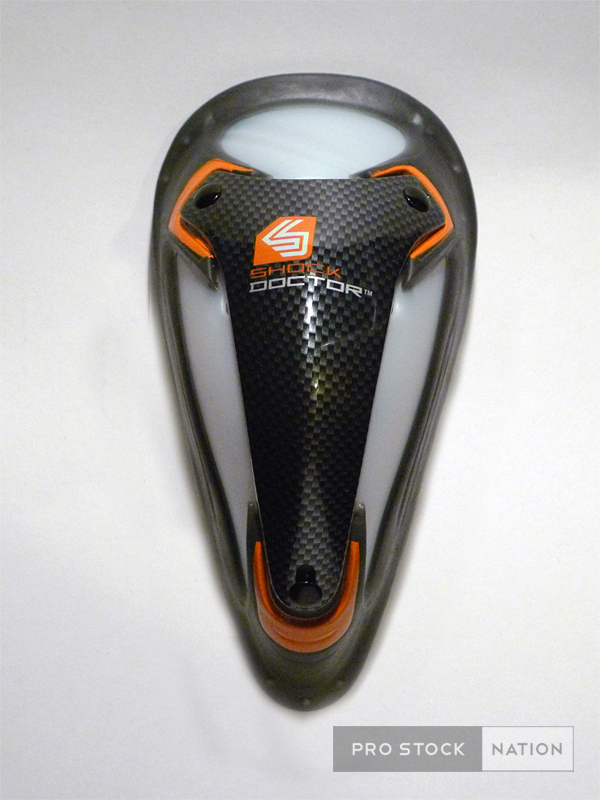 On the front of the leg, in the shin area, lies the “Gripper Pattern.” This will help prevent the shin pad from slipping. This pattern is very durable; I’ve put the pant through about 15-20 washes so far and the pattern is still in tact. I’ve experienced peeling with similar grips on some other brand’s base layers I have worn. The pant comes with the Ultra Carbon Flex Cup. It is designed to disperse the shock away from vital areas. The flex curve design and the gel pads around it make it very comfortable to wear. I’ve tried flexing the cup that came with one of my jock shorts and it has no give in it at all. Dare I say this Shock Doctor is the most comfortable cup I’ve ever used? The Ultra Carbon Flex Cup works in conjunction with Shock Doctor’s patented X-Fit Brief Cup Retention System. The liner somewhat reminds me of the ones used in swim trunks, but with an added pocket for the cup. I get a much better fit compared to the standard jock shorts (with two elastics to keep the cup in place) that I typically wear. Fit: It is a very comfortable pant. I would recommend ordering your usual pant size. I am 5′ 9″ tall, 140lbs and I wear the Men’s Medium. It’s not skin tight, just slightly loose but not to the point where it is baggy. I also feel I get a wider range of motion with these pants compared to wearing a standard jock short. You just don’t want to get these pants too big otherwise the ShockSkin pads won’t wrap around your body properly. I’m also the type of player who likes to wear knee high skate socks when I play. I found it was much easier to have the socks on underneath the pant, rather than trying to pull the socks on top of the pant. The Gripper Pattern makes it a little bit tricky to pull your socks up over top without rolling up the pant in the process. Build quality: This pant is built like a tank. I have worn this to play goal as well and had a few stray pucks find their way up the opening of my pant leg and hit the ShockSkin pad right above the knee. On a similar note I also wore these pants skiing this past season. Not only did they help keep me dry on the slopes but the padding on the hips did spare me from getting a few bruises. Needless to say, both incidents didn’t hurt. Value: Currently selling for $89.99 on Hockey Monkey, some may experience a bit of sticker shock initially. However after trying on this garment I’m certain you will agree you are getting what you are paying for. Durability: As I mentioned earlier I have put this pant through approximately 20 washes and it is holding up very well. All of the graphics, seams and the ShockSkin foam pads are still in tip top shape. The pant does not retain smells like some of the other moisture wicking pants I own. Washing: I just remove the cup, flip it inside out and throw it into the washing machine on a cold water setting. Hang to drip dry. The care tag says you can Tumble Dry Gentle as well but I have never tried it. Other factors: The areas where the ShockSkin pads are do get a bit hot while playing if you are in a warmer than usual rink. The mesh is a nice touch and does wonders to help with the air flow compared to pants that are made with strictly one material throughout. If you buy the pants too big, the foam pads do feel a bit restrictive. 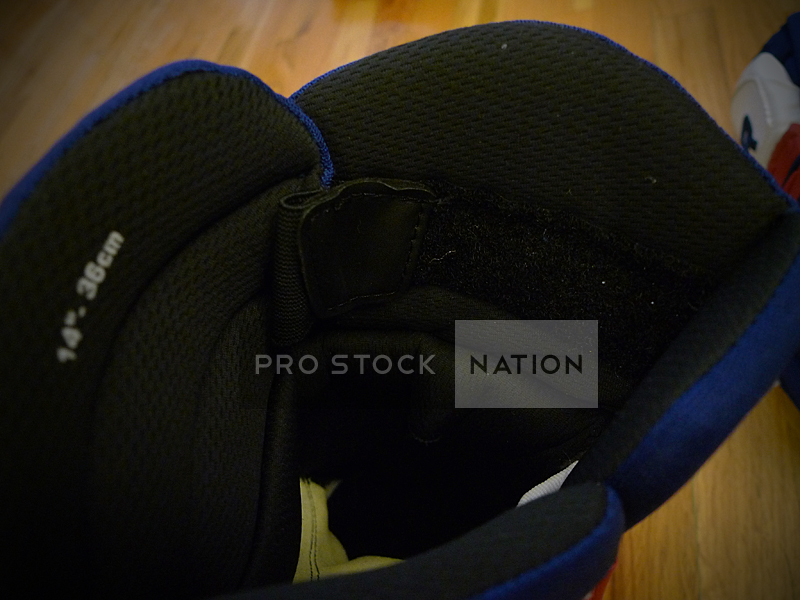 Final Grade (A-): The Shock Doctor 581 ShockSkin Hockey Impact Pant is a very high end and well made product. The Ultra Carbon Flex Cup is without the doubt the most comfortable jock I have ever used. The only reason these pants didn’t get a higher grade is because the ShockSkin pads do maintain some heat but not to the point where it is uncomfortable. The extra protection you get outweighs the slight increase in temperature. Prior to using this product I was using mostly moisture wicking shorts from various companies. Since then, I have made the switch to using long pants whenever possible and I would not hesitate to choose another Shock Doctor product. I would absolutely recommend this pant if you are in the market for a top of the line base layer. 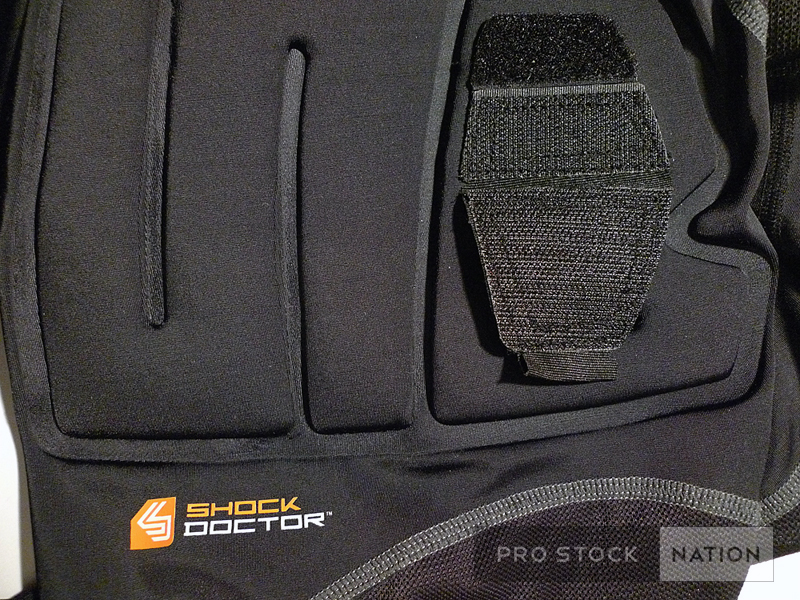 Check back in the near future for our review of the Shock Doctor 572 ShockSkin Hockey Impact shirt. Also be sure to check out Shock Doctor’s official video on the 581 pant. Will The Real ProStockNation Please Stand Up? Hi everyone, we have been getting several emails from readers asking us if we sell equipment and the answer is no. 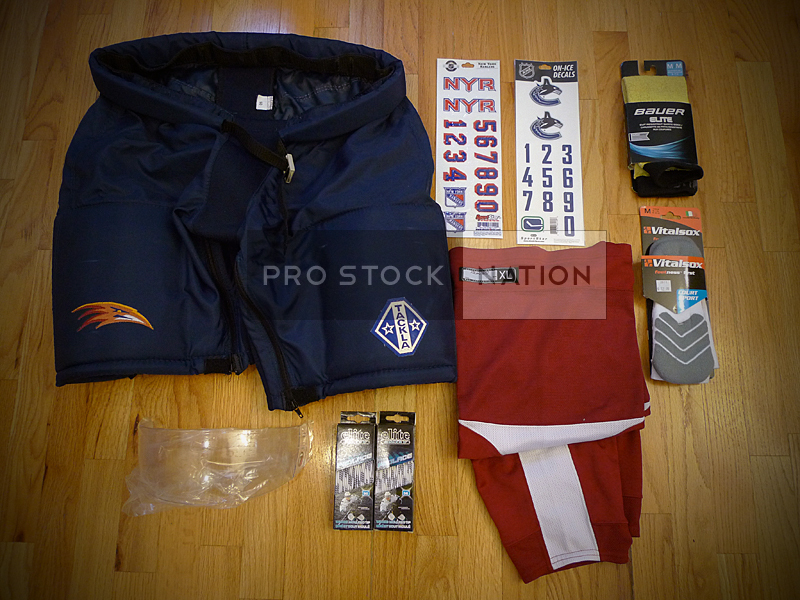 Other than eBay, there are various hockey equipment forums and websites where you can find the gear you’re looking for. Searching for pro stock equipment is half the fun of this hobby. 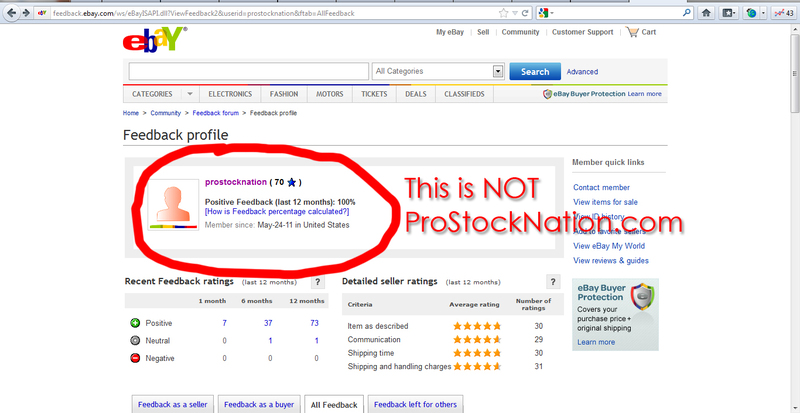 It was also brought to our attention there is a seller on eBay using the name “prostocknation”. This is NOT us. We are the originator of this name. Nobody else has ever used ProStockNation before us. We were founded in 2010 in Vancouver, BC. This individual signed up for eBay in May 2011 from Kenmore, NY, USA. We do not sell on eBay and currently have no intentions to do so. We are not affiliated with this user in any way, shape or form other than the fact they have copied our name. The Calgary Flames’ 2012 Used Equipment Sale is upcoming! This is about half their sticks available. I can see various U+, ONE95, 11K, Widows, Dolomites and Total ONEs. Pro Stock practice jerseys in a variety of colors and sizes. You definitely won’t find these in retail stores. Keep in mind these run from sizes 54-60. On top of the usual home/away black pants and gloves they also have gear from their Alternate sets. I’m more of a fan of these colors. I wish the Flames would use these full time. Of course it wouldn’t be an equipment sale without goalie gear. Here’s your chance to own Kipper or Karlsson’s combo. But ultimately the item that interests me the most at this sale is Henrik Karlsson’s mask. At $2500 it is an absolute bargain for a NHL used mask. Goalies tend to hang onto their masks so when they’re made available for sale they command big dollars from collectors. Unless your name is Jarome Iginla or Brad Richards, Easton won’t even make these Z-Air gloves for you. Luckily you have the chance to own a pair at this sale. Lastly, Cammy’s pants and helmet he brought over from the Habs are for sale as well. Any equipment remaining at the end of this sale will be made available through FanAttic’s mail order line. Be sure to share your pick ups with us! Please contact them directly with any questions you may have regarding this sale. *All photos and logos used with permission from FanAttic. With the Winnipeg Jets inaugural season done, the remaining equipment is now available for sale through Play It Again Sports Winnipeg. The list below lists some of what they have available during their pro stock stick sale. If you’re not in the Winnipeg area you can contact them by phone (204 256 1115) or email (playitagainwinnipeg@gmail.com) with any questions you may have or to place an order. Greg also sent us an inventory list of their most recent equipment drop of sticks, skates and a little bit of goal. Pants, gloves, helmets and other protective are expected to arrive after development camp in July. 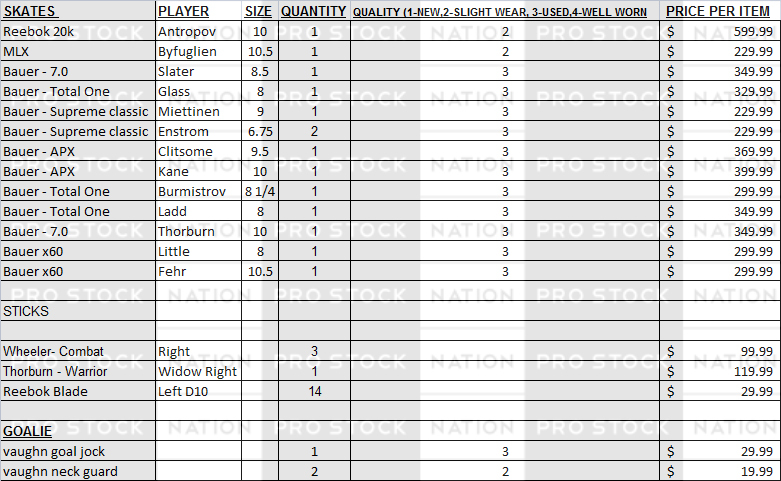 Please note this is NOT a complete list of their inventory, just their pro stock sticks and their latest drop. If you are looking for anything else please contact Greg from PIAS Winnipeg directly. Be sure to share your pick ups with us! What does Jaromir Jagr do to get his sticks ready for games? CBC’s Hockey Night in Canada ran a segment on how Jags incorporates superstition and religion into his prep during a Flyers/Devils playoff game. What do you write on your sticks? I picked up a couple things during my recent trip to California. It’s hard to forget about hockey even during the nice weather. Expect to see several of these products reviewed on ProStockNation in the near future. Atlanta Thrashers Tackla 5000 Pro Lowers (Brian from Sports2K.com forum): Also called a “padded shell”, the thing I like about Tacklas are they are compatible with virtually any Upper you pair it up with. Not only are they pro stock but they are Made in Canada as well, two of my favorite combinations. SportsStar New York Rangers and Vancouver Canucks Decals: These are probably the closest things most of us will ever come to finding helmet decals on the retail market. I paired these up with my Vancouver Canucks game worn helmet and the orca logo sizes are roughly the same sans the two tabs but the numbers seem a tad short though. I wish these came with the NHL shield decal as well since that one seems to be the hardest one to find for most of us in the pro stock collecting hobby. LA Kings Pro Stock Reebok Edge Practice Socks (Jake’s Custom Sports, El Segundo, CA): Made in Canada. Picked these up at Jake’s. His shop is a definite must visit if you ever drop by LA. Jake’s Custom Sports is just a stone’s throw away from LAX. Try eating at El Pollo Loco while you’re there too. I couldn’t get enough of that place when I was in California. Anyways, Jake’s is the place to get any repair work done or if you’re looking for gear (especially used Kings gear.) The service is top notch as well. I prefer to wear Pro Stock Reebok Edge socks over the retail ones because the difference in quality is night and day. 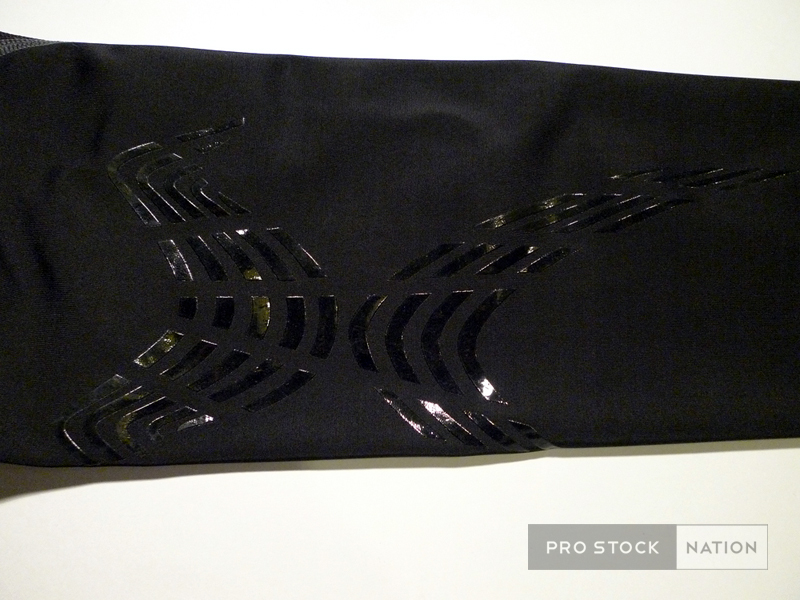 The Pro Stock ones will also stick to velcro for all of you who wear jock shorts. Elite Waxed Laces: Made in Canada. I’ve been using these laces religiously for the past couple of years. They’re less expensive in the States compared to Canada so I might as well pick up a couple pairs while I’m there. The thing I like about these the most are the molded tips. Previously, when I used a different brand, the tips breaking were the most common reason for me having to replace my laces. If your skates have been feeling loose as of late you should give these a shot. They are $4.99 at most places in Canada. Tron S10 Visor (HockeyTron): We’ve had several readers contact us regarding Tron products. For those of you who are unfamiliar, they sell their own brand of “copycat ” products that are Made in China. This visor retails for $13.99 in store. So how does it stack up to the leading competitor’s visor that can be $60 and up? We will compare the two shortly. Some of you may recognize these gloves from our previous post on Saturday. 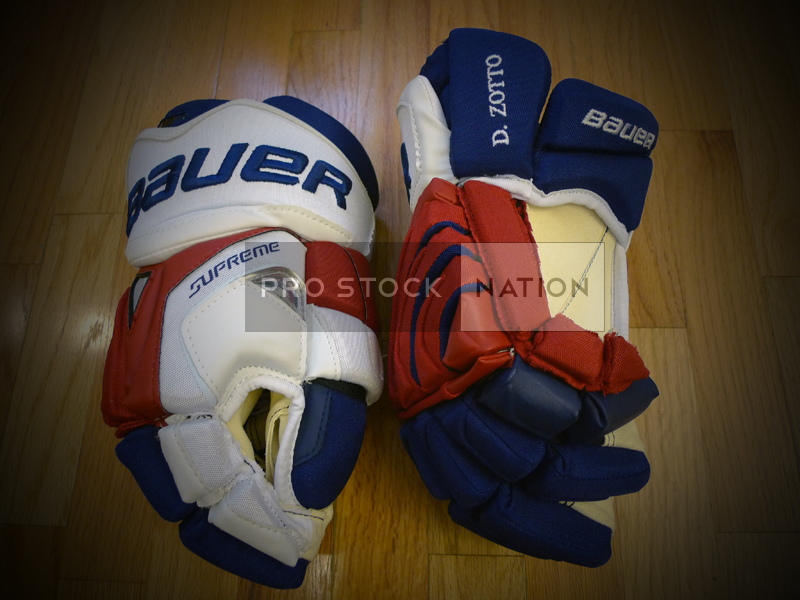 They are Michael Del Zotto from the New York Ranger’s Bauer Supreme ONE95 Pro Returns. Supremes are one of the tightest fitting gloves on the market and I like the adjustable cuff on the inside. It provides the user with an option between protection and freedom of movement. My taste in gloves have definitely changed since starting ProStockNation. I used to prefer a very loose traditional 4-roll style glove but after using the Vapor XXXX Pro and Vapor X:60 Gloves I’ve started to like tighter-fitting anatomical style gloves. These feel really nice straight out of the box unlike the retail ONE95 gloves which would continuously rub against my knuckles whenever I opened or closed my hand. I also wasn’t a fan of the feel of the futuristic-looking/feeling reflex palm that it came with. Aesthetically I also found the retail version to be not very pleasing to the eyes. This NYR colorway actually makes it bearable to look at. More pick-up posts to come! You are currently browsing the Professional Use Only, No Warranty. blog archives for May, 2012.